This design inevitably carries us back to our childhood and the wonderful world and heros' adventures we first heard from our parents, then read ourselves as our curiosity and thirst for discoveries made us come across the books ourselves. 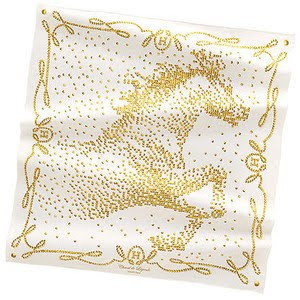 "Cheval de légende" ("Legendary Horse") pays tribute to Pegasus, the horse brought to life by the Greek mythology. The legend recounts how the Greek hero Perseus cut the Gorgon Medusa's head off, and from the spilling blood Pegasus, a beautiful white winged horse, sprang to life. Ancient etymology links the name to water and springs: the so-called Hippocrene spring on Mount Helicon marked the spot where Pegasus struck a rock with his hoof. Its waters were a source of poetic inspiration. On Mount Olympus, the gods' home, Pegasus was entrusted with the sacred task of carrying Zeus's thunderbolts, until he was tamed by Bellerophon (with the help of Athena, the protectress of heroes, who presented him with a golden bridle). Bellerophon, the hero charged with slaying the hybrid monster Chimaera by the Lykian king Iobates, slipped the bridle around Pegasus's neck while the horse was drinking, and climbed onto his back. Thanks to Athena's intervention, Bellerophon was able to slay the Chimaera. After Bellerophon's death, Pegasus rejoined the gods, and eventually became a constellation. 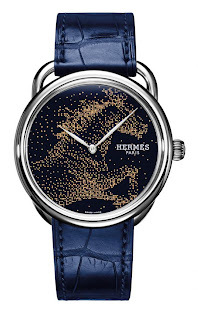 The reference to the constellation (named Pegasus) is wittily depicted in the design by way of the tiny dots, each sparkling with a magic light, that together depict the front part of a horse about to take off. As with many other designs, the horse brings so much energy to the scarf and instills in it the admiration that such a noble animal commands. 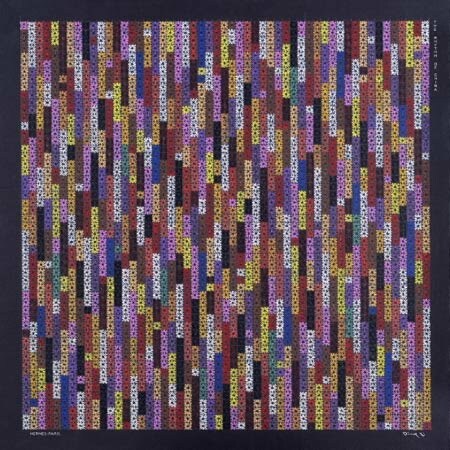 The overall depiction is sadly lost when the scarf is tied - another testament to how this scarf manages to convey different feelings and moods, depending on how it's displayed. The apparent "rope", also made up of little stars, adds the element of border (as with a painting) to the design, and renders the scarf more interesting when knotted. Overall, a very contemporary design best admired for its non-traditional colours (the fuchsia and the green particularly stand out for their unusual hues). 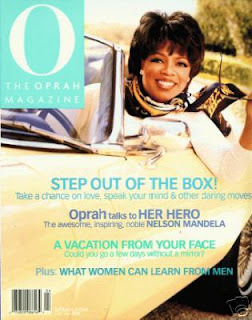 It is also reminding me of the "pearls" design featured as part of the spring/summer collection - which I featured last week. 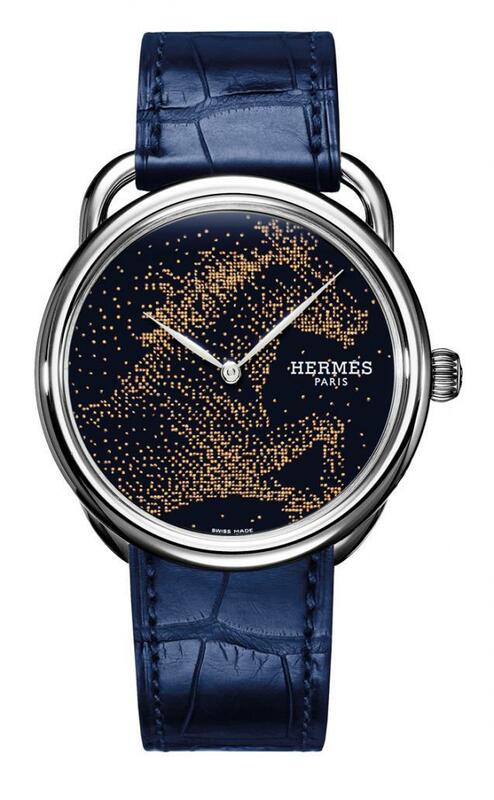 Meanwhile, so confident was Hermes in the success of this design, that it decided to expriment with it as the dial of the Arceau model. The fascination with this scarf stems from two classics of our times: Princess Grace Kelly, whose rafinement and indeed grace has inspired countless artists to dedicate their creations to her and even name such creations after her, and the timeless pearls, themselves a symbol of immaculate purity, of valuable possessions and most importantly of treasured objects whose beauty is meant only to enhance the beauty of the wearer. "Kelly en perles" (Kelly in pearls") is an exploration into the fantastic, a reinterpretation of classic aesthetic into contemporary tastes and standards. 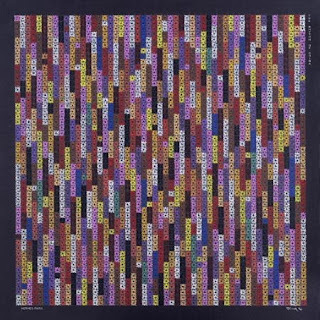 The actual composition, suggestive of colourful glass beads in the style of artists from Cameroon, confers upon the scarf a very tangible sensation - thanks to Hermes' fine-tuned and impeccable techniques of rendering 3-D objects into 2-D spaces. The focal point of this scarf is the timeless Kelly bag, itself formed by countless beads in a most realistic depiction. The actual scarf is not necessarily at the top of my preference in terms of design (neither displayed fully, nor knotted), but it is most memorable for the pattern, reminiscent of the beaded coin purses so popular in the country side during my childhood in Eastern Europe, little treasures that continue to make me smile, even after so many years of having been burried in the back of my memory's "drawers". So in this sense, I perceive this scarf as triggering utterly "happy" memories for me. Back in early January, I featured a design, called "Hermès en voyage", inspired by artist Ding Yi's work. This fall/winter design "Rhythms of China" is a very close interpretation of the artist's creations (one in particular springs to mind, namely 2003's "Appearance of crosses - 12" for instance). On closer inspection, the individual "pixels" are in fact delicate snow flake-like stars, forming a tight web of equal harmony and vibrant energy. When knotted, the dynamism of the pattern becomes not only visible, but also much more impactful. 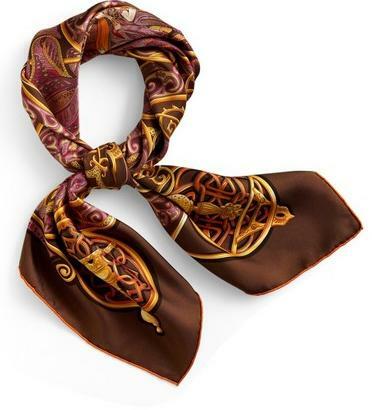 A very contemporary scarf suited for young stylish and mature sophisticated ladies alike. 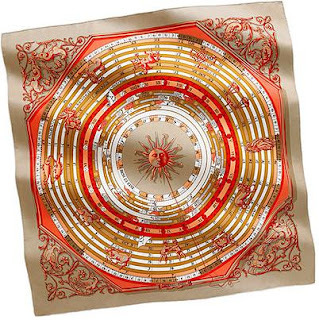 An interesting detail about this scarf: it was launched in China by the Maison several years ago, and featured in an exhibit organized in September 2007 in Shanghai at the Shanghai Art Museum to mark 70 years from the launch of the first scarf, and 10 years of the Maison catering to the Chinese clientèle through local boutiques. 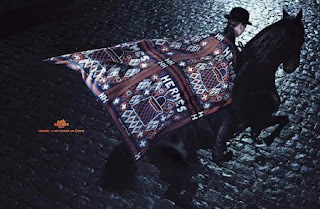 Regardless of when this design was released, this scarf is thoroughly impressive ! 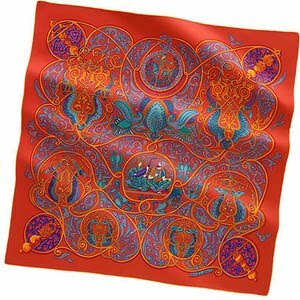 This scarf draws its inspiration from the One Thousand and One Nights (known in English as the "Arabian Nights" from its first English language edition in 1706, which rendered the title as "The Arabian Nights' Entertainment"). In the centre of the scarf, seated next to the Persian King (Sultan), is none other than his beautiful new bride, Sheherazade, who mesmerizes him with story upon story (which she begins every night, but does not finish until the next night). "La charmante aux animaux" ("the Animal Charmer") picks on one such story, telling of the animals who roam freely on this earth. 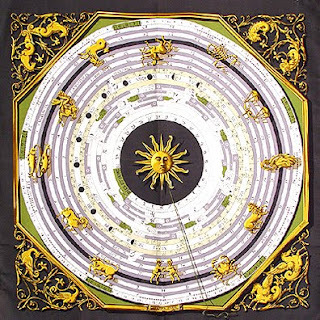 As always with Annie Faivre, whose nickname is "little monkey", she chose to include the representation of a monkey in the detail of this scarf. What I find interesting is that the design is very baroque in its richness, and the organic pattern that provides the background for the design; because of this, the scarf has a rather traditional feel to it (as opposed to lighter and asymmetrical motifs that would define it as more modern) and so I anticipate this scarf to be more appealing to a more matude crowd, despite the timeless theme. This design has been among the most popular designs that Hermès has produced. With this post I am taking a detour from our current collection so as to feature something spectacular and mesmerizing that's worth of at least one post. Since its launch in 1963, "Astrologie" ("Astrology") has been reissued at least 17 times over the years. 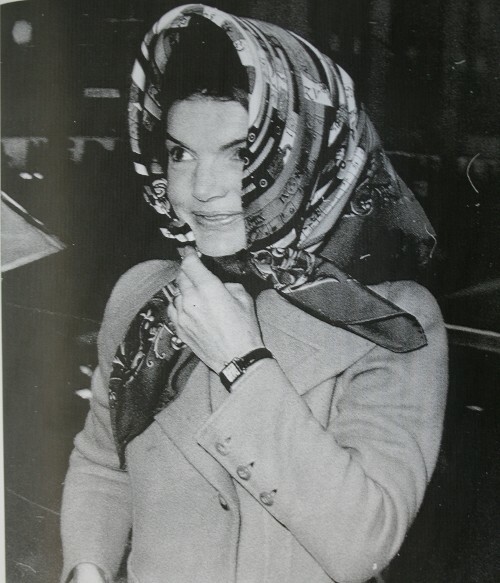 Its success has been so tremendous, that many recognizable stars have opted to sport a scarf depicting the Astrology design on the cover of magazines and making newspaper headlines (see below Jackie Kennedy, before she became "Mrs. Onassis", as well as Oprah on the cover of her magazine). Conceptually simple, the design is spectacularly embellished to regal standards of beauty and harmony.